One look in the car seat aisle at your favorite department store can be overwhelming. You know you want to keep your baby safe, and comfortable, and that you need a car seat that will fit your budget and not break the bank. But does your baby need cup holders? A five-point harness? Microfiber cushions? A newborn head roll? Is your brain starting to spin? Keeping your baby safe in the car is your most important priority and since most of us spend a good deal of time in our cars, choosing a car seat is a big decision. Not just any car seat will do. 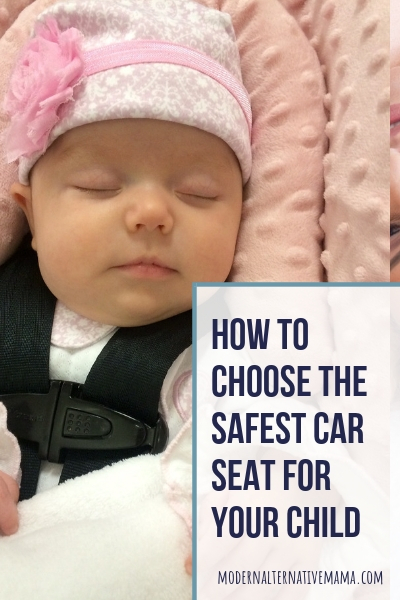 You want to know exactly how to choose the safest car seat for your child. With a little education, you’ll be well on your way to keeping your precious little one safe. It’s really not as overwhelming as it may seem, and by the end of this article, my goal is to help you know exactly what you’re looking for in a car seat. Most states require your infant up to one year of age to be in a rear facing car seat. More recently, some states have begun to suggest that infants remain rear facing until the age of two. The AAP recommends that childern remain rear facing until they reach the heighest weight or height limit allowed by their seat. This can often extend well beyond 2 years. The bucket style infant car seats with a handle that fit into a base are only suitable for rear facing. As your child outgrows an infant carrier car seat, the next option is a convertible seat that functions in the rear facing position, but can also be used in the forward facing positionwhen your baby is big enough. Unlike convertible car seats that can be used in both rear facing and forward facing psitions, some car seats are only suitable for forward facing. This will be indicated on the box. For obvious reasons, these car seats are not suitable for rear-facing usage. Once a child has reached the required age and weight requirements for your location (be sure to check) they may graduate into a booster seat, which allows your child to use the vehicle’s integrated seat belt. They can be as simple as a small booster that lifts the child up, and as intricate as a luxurious looking high backed seat with head rests for when the child sleeps. Every vehicle is equipped with seat belts that should properly restrain your child. Be sure to check the age and weight requirements for your location to make sure your child is ready to use your vehicle’s integrated seat belts. In order to choose the best car seat for your needs, a good place to start is your vehicle’s owner’s manual. You may find suggestions for what car seat will best fit your vehicle. If your car seat uses the LATCH system, (special straps that connect directly to the vehicle’s seat with a hook) then you might look for a car seat that integrates with the LATCH system. 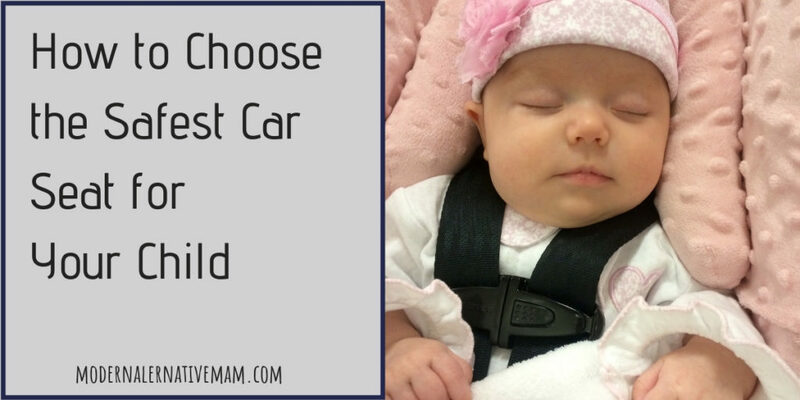 Now that you know the different kinds of car seats, it’s important to choose accordingly. The best way to do this is to measure and weigh your child. Then when you are shopping for your car seat, check the side of the box for the specific specifications of that particular seat. Do not put your child in a seat that is too big or too small. Neither one is appropriate and could result in injury or death. Here is a very helpful guide for you to use when choosing your child’s car seat. As mentioned previously, it is very important that you know your location’s specific requirements. But don’t just go by the laws. For example, your state might not require your child to be rear facing until she’s two, but since studies are indicating that it is definitely the safest, then it’s a good idea to keep her rear facing as long as you can. It’s easy to think, “It’s a car seat. How hard could it be to install it?” But despite your greatest temptation to install the car seat quickly, it’s always best to follow the instructions. Remember your child’s safety is at stake. You might not think your innocent little one could get out of a car seat buckle, but kids are smart. They know how to figure things out. The older they get, the more ingenuitive they become. Choosing a car seat with intricate buckles will make it harder for your child to crack the code. I’m a firm believer in checking reviews. Of course you need to take reviews with a grain of salt. Some people just like to be snarky for the sake of being critical. However, if you see a repeating pattern with reviews, steer clear of that car seat and choose another. Even if you aren’t purchasing your car seat on Amazon, it still warrants using their library of reviews to check out before you buy. I like to check several of the top reviews, several of the one star reviews and a few right in the middle. If you buy a car seat and it just doesn’t work for you. Return it. Recently, my husband and I picked out a nice, mid-grade car seat for our 18 month old. After going through all of the aforementioned points, we decided on a seat that fit what we were looking for. We happily installed the car seat and belted our baby in, and then after taking a closer look, we realized the car seat didn’t fit his little body comfortably. His head seemed to be pushed forward and his back lacked support. We promptly returned the car seat and went for a different model. I’m so glad we didn’t just try to make it work. Returning a car seat that isn’t a good fit for your child is ok to do. A car seat is one thing that should always be purchased new. It’s important to know the history of your child’s car seat. If it was ever in an accident, it’s no longer safe to use. Therefore, buying a car seat at a rummage sale or second hand is not a good option. Also beware of a well-intending friend passing on a car seat to your child. Make sure you know and trust the person enough to find out the history of the car seat and whether or not it was ever in a car accident. Did you know that car seats actually have dates on them that list when they expire and should no longer be used? To avoid buying an expired seat, it’s just safer to buy new. Every car seat comes with a little postcard specially marked with a serial number. SEND IN THAT CARD! It is so important. If your car seat ever becomes recalled, the manufacturer will get in touch with you and give you proper instructions for how to proceed. Be sure to check out this post for the proper way to use your car seat and some common mistakes that are easy to make. What tips do you have for picking out a safe car seat for your little one?